A 50 basis point hike in interest rates in January, with the possibility of further hikes during the course of the year, increasing fuel costs and rising inflation dampened the first quarter of 2014 growth prospects of small and medium enterprises (SME) in South Africa when compared to the last quarter of 2013. 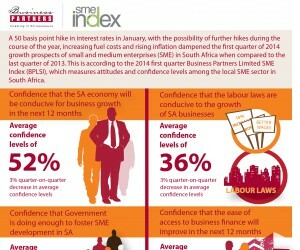 This is according to the 2014 first quarter Business Partners Limited SME Index (BPLSI), which measures attitudes and confidence levels among the local SME sector in South Africa. Business owners across various industries have expressed average confidence levels of 73% that their business will grow in the next 12 months, and average confidence levels of 52% that the South African economy will be conducive for business growth. Both indicators have decreased by 300 basis points when compared to the fourth quarter of 2013. When questioned on the main challenges SMEs are likely to face in the next six months, 31% cited economic conditions (a quarter-on-quarter decrease of 2%); 25% indicated cash flow (a quarter-on-quarter decrease of 2%) and 20% indicated funding (a quarter-on-quarter increase of 4%). Respondents expressed average confidence levels of 50% that the ease of access to business finance will improve in the next 12 months, the same level recorded in the fourth quarter of 2013. “It is quite probable that the January 2014 interest rate hike, and the possibility of further interest rate increases during the year, will adversely affect these confidence levels in the coming months. SMEs should be cautious before sourcing additional credit – specifically ensuring that their businesses can indeed afford the increased cost of credit,” warns Martin. Low confidence levels (31%) were once again recorded around Government doing enough to foster SME development – no different from the fourth quarter of 2013. Martin stresses that policies and regulatory compliance which affect the ease of setting up and expanding a business need to be abolished (where superfluous) or amended – thereby allowing and encouraging SMEs to expand and employ more people. "With the establishment of the Small Business Development Ministry, government has signalled its intent to free-up and encourage the establishment and growth of SMEs. It would be interesting to see how entrepreneurs react to this announcement, as well as any progress which the Small Business Development Minister may have made, in the next quarter,” says Martin. He points to a newly introduced question in the BPLSI, which revealed that 52% of respondents have appointed new employees in the last year. “This is an encouraging indicator as SMEs are responsible for about 60% of new jobs created annually. By enabling SME development in the country and reducing red tape in terms of the compliance burden from municipalities to the department of labour, it will aid in supporting small business development and in turn boost job creation and economic growth,” concludes Martin.